I remember when Pierce used to go out all the time in costume. I can recall writing a blog post about a trip to the zoo, where he was dressed as Buzz Lightyear. Now he's embarrassed by his brothers, who are only too happy to head out in public dressed in costume. It's kind of sad how fast they grow up. I wish they'd always be small enough to be excited to go out in costume. But it seems they outgrow that tendency. 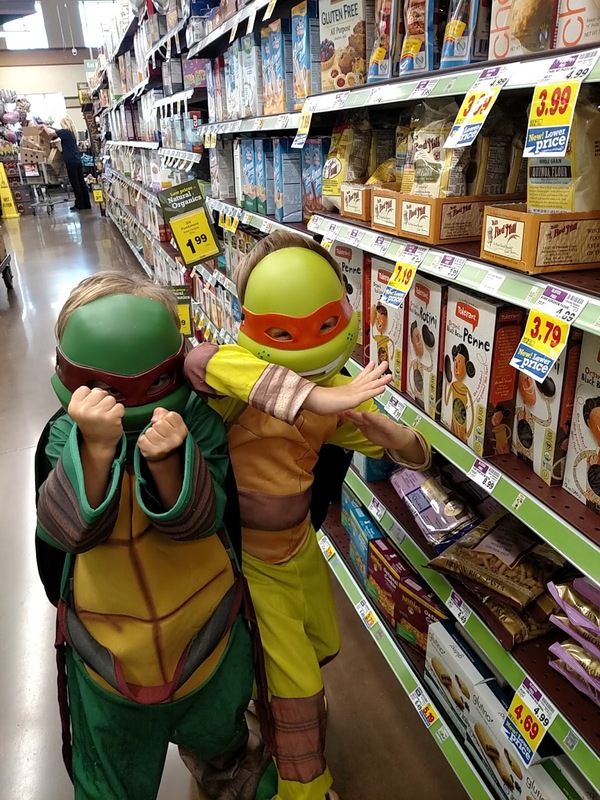 The twins had so much fun that day with all the attention they received from customers and the grocery store employees. They boys are funny, regardless. Recently Cort came up to me and said, "Mom! I figured out why boys don't have long hair!". I said, "Why, Cort?" He replied, "Their body is saving it up to make mustaches when they grow up!" The other day Pierce was looking something up in the dictionary/thesaurus. Reid was walking by and exclaimed, "Thesaurus!! What kind of dinosaur is that?! I want to read about it!" On a side note, I have a question for other bloggers, particularly bloggers who write about farming, sustainability, homesteading, or related topics. Would any of you be interested in a closed community on FB for open discussion? I have searched for something similar, but the only one I found was by a blogger who just posted her own posts all the time, and didn't involve much interaction with members. I wanted more of a community feel. If there are others who are interested, I thought I might start one. Okay, just one more thing today. I have a guest post about boys in dance that you can read on The Soccer Moms Blog. TMNT have been around since my oldest son. That's some longevity. Hard to believe he's 28 now. Now I have my granddaughters dressing up in costumes and acting silly. Sounds good but I don't have FB, I found that it was wasting a lot of my time but a closed one might be different. Cutting wood again over here. Love Cort's reasoning, made me smile and laughed out loud when I read about that dinosaur! They do grow up too fast! Yes, a closed community on FB would give an opportunity to share and learn. How funny Cort came up with saving hair for a mustache. So cute. I read the post and it was so well written, Lisa. So cute! S...l...o...w shopping though I bet. Absolutely cool characters to meet while shopping! Mica used to dress up to go outside to play. He doesn't do that now. Isaak I know misses playing in costumes outside with his brother. So sad that they have to grow up. They look so cute! I love Cort's thoughts on men's short hair. Reid's comment was sweet too on the Thesaurus. I live in the city, so wouldnt be eligible for the FB page, but know it will be good if you start it. The boys are so cute, and hope they can stay that way a few more years. My grandson next door comes in a lot of times dressed as some character and I have to guess who it is! I love your boys the way they look wearing their cute costumes. I am sure they all have a great time playing with their costumes. My favourite game was to play as if I were a cowboy riding invisible horses. Have a wonderful week with your awesome kids and family! No matter what their doing, your boys make us smile... Everytime! I would love a group like that! I feel like a lot of the homesteading bloggers that I started following years ago are no longer blogging, so I miss that community :-) Of course my blog has evolved as my kids have grown, but I would still love to be able to connect with like-minded people! And I love that the TMNT have made such a comeback. My brother loved them growing up, and now Jack loves them too! I miss when my boys dressed in costume, too. Such fun. So unencumbered by social "norms." Thank you for inviting me to your rural facebook page, and have a super day! LOL... the body is saving up to make mustaches. Now that is funny.